We are pleased to offer world class trainers who have dedicated their lives to their passions. 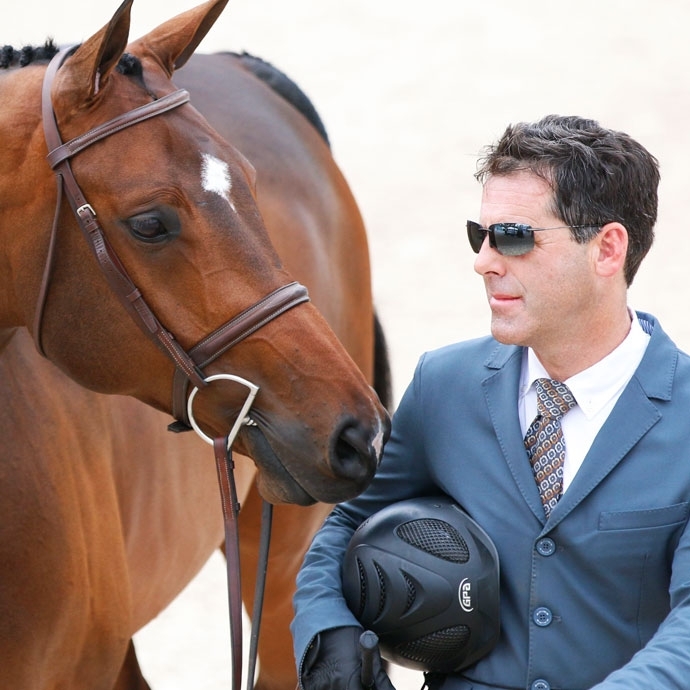 Peter Lombardo has judged many prestigious competitions across the United States and Canada in the Hunter and Hunter Seat Equitation divisions. And combining his passion for teaching, and skill and experience in the sport, Peter has developed a great system and format for teaching larger groups in clinics across the country. In 2009, Peter realized his dream of running his own stable by opening Frontier Farms™. Read more about Peter and Augusta, below. 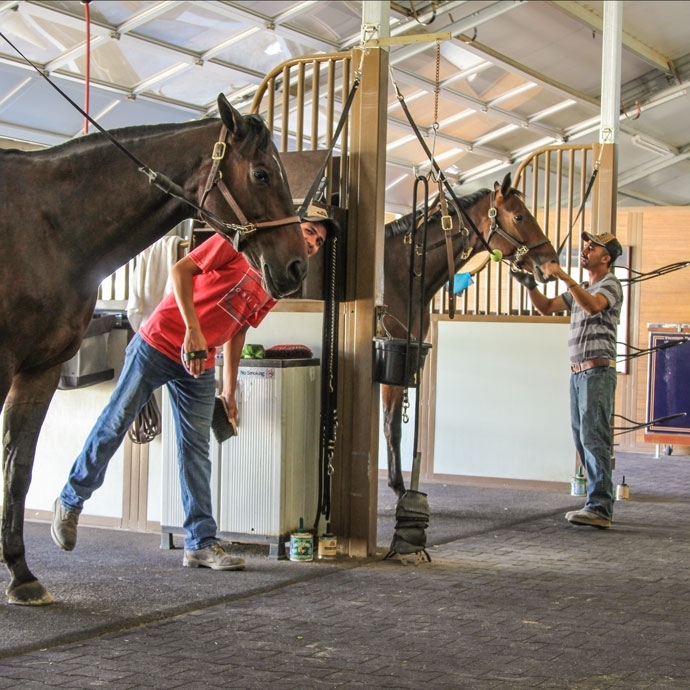 We ship our own horses to control scheduling and ensure consistency of equipment. We submit your show entries and handle your horse’s arrangements for the upcoming competitions. 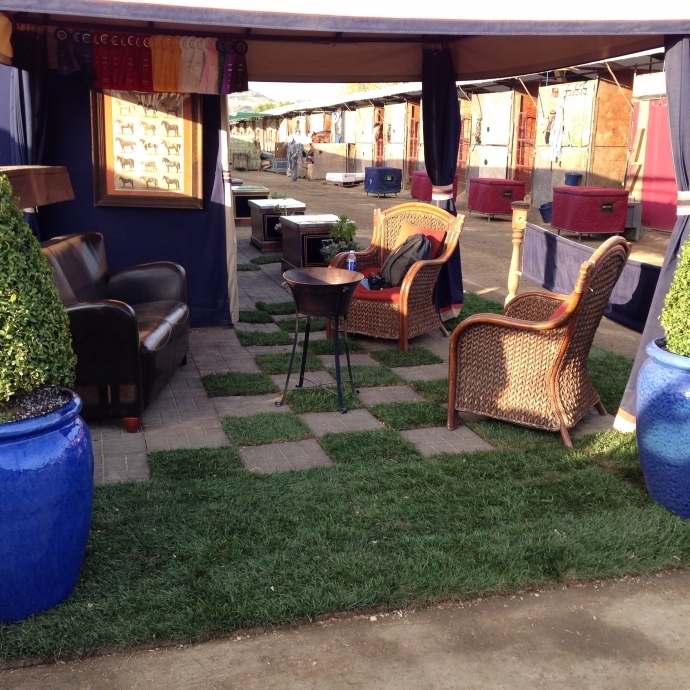 Once at the show, we handle the "check in" and "check out" process in the horse show office. We see to your horses every need while at the show. Frontier Farms features a fine selection of quality horses for sale, and for lease. We love “glamorous horses” - our young hunters and jumpers are carefully chosen for their movement, temperament, conformation, style and ability. We find great horses in the American show rings, as well as on scouting trips to Europe and beyond. Our young prospects are meticulously brought along at home. We then promote them at shows with juniors and amateurs, until we feel they are ready for sale. Peter grew up in Wilton, Connecticut. Peter’s grandmother introduced him to horses while visiting his aunt’s farm in Nashville, Tennessee at the age of 8. After that experience, Peter knew that he wanted nothing more than to dive into riding lessons. Peter's father, shared his sons interest in horses and competition and helped propel Peter into the horse show world in the northeastern USA. 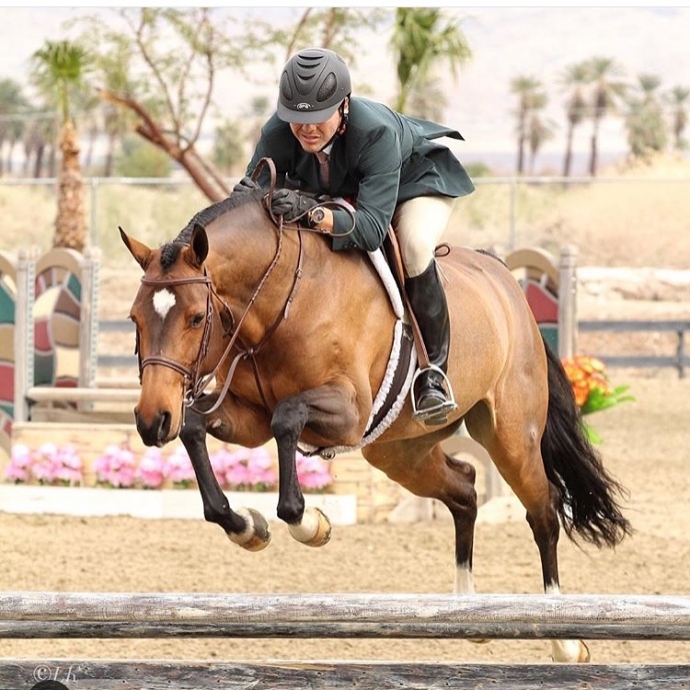 As a junior rider Peter studied and competed in hunters and equitation with the late, great Ronnie Mutch in Weston, CT. Ronnie came from a career in advertising, and brought to the sport a creative and stylish flair. He was a very dynamic teacher and master horse-rider promoter. Ronnie’s book, “Mutch about Horses”, is beautifully illustrated with cartoons about the "lighter side" of hunting and showing horses. Peter is mentioned in the introduction of the 2001 edition. During his college years and as a young professional, Peter worked with top riding professional and judge Carol Molony in North Salem, New York. Carol had been a champion rider, winning both the National Junior Medal and Maclay Finals. She was sidelined from competing with a riding injury, but continued to share her great expertise in teaching and in bringing along young horses, as well as promoting top show horses to National Awards. Peter learned many of these invaluable skills from Carol over the course of their 10-year relationship. Peter still practices many of these today and is very grateful to have learned from such a knowledgeable, patient and kind mentor. Peter then traveled abroad for eighteen months, to work and show with riders in Europe. Show locations included: Yverdon Le Bain; Switzerland; Athens, Greece; Florence, Italy; the 1990 Junior European Championships in Mons, Belgium; The Balkanic Games in Istanbul, Turkey. One of the trip highlights was when a Greek rider, who Peter was training as chef d'equip, won the World Cup Qualifier in Plovdiv, Bulgaria. This experience provided Peter with the opportunity to see top tier competitions with the highest levels of riders. Peter quickly realized there was much more to learn! This started his lifelong quest to study everything he could about great horsemanship and training. Next, Peter worked with Karen Healey for three Winter circuits in Indio California. Karen eventually convinced Peter to move to California in 2001. It was there from 2001- 2009 that Peter worked for Archie Cox, training horses to several National titles. 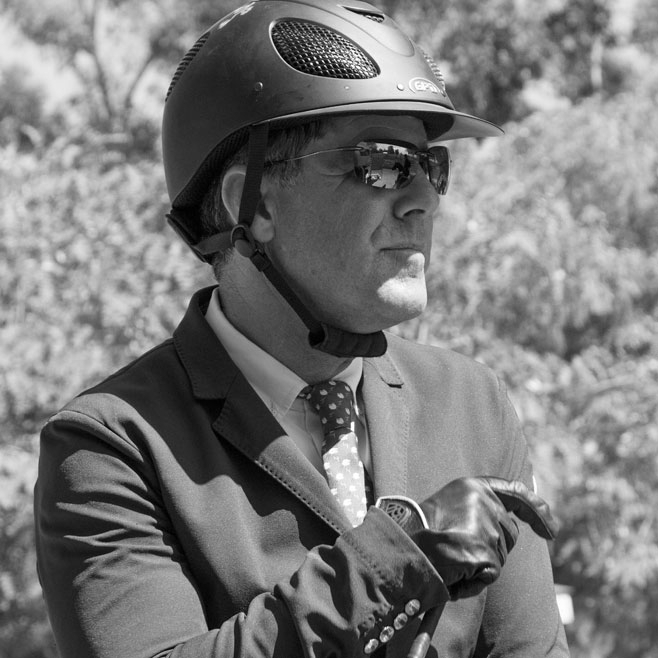 As a Clinician and large “R” judge, Peter has judged many prestigious competitions across the United States and Canada in the Hunter and Hunter Seat Equitation divisions. And combining his passion for teaching, and skill and experience in the sport, Peter has developed a great system and format for teaching larger groups in clinics across the country. In 2009, Peter realized his dream of running his own stable by opening Frontier Farms™. Frontier Farms, located in Moorpark, California continues to be the most exciting and rewarding experience of Peter’s life. Finished top 4 of National Junior PHA Medal standings. Finished top 10 of the 1982 ASPCA Maclay Finals. Fall Indoor Circuit, including the National Horse Show at Madison Square Garden in NYC, on Steve Holmes' "Brazen", in the Regular Conformation and Regular Working hunter divisions with top honors. Moved to Europe, working in Athens, Greece and Frankfurt, Germany. Peter also traveled with riders to competitions throughout central and Eastern Europe. Reserve Championship at the Devon Horse Show in the Regular Conformation Hunter division with "Mandarin"
Championship at the Pennsylvania National Horse Show in the Regular Conformation Hunter division with "Mandarin"
Trained winner of the CPHA Junior Medal Finals, Morgan Geller and "Fabricio"
The National Horse Show, Syracuse, NY, Grand Junior Hunter Champion, Morgan Geller and "Fabricio"
Judged the New England Junior Equitation Finals in Springfield, Massachusetts, the largest medal finals that year in the United States. Champion High Performance Hunter with "Chapman" at the Upperville Horse and Colt Show, in Upperville, VA, the oldest Show in the country! USEF West Coast Junior Hunter Finals, Grand Champion, Morgan Geller and "Fabricio"
Won the Trainer's Equitation Class at the Santa Barbara National Horse show. Winner of the Amateur Owner 3'6" 35/over stake at the Devon Horse Show, Janie Andrew and "Ante Up". Alltech National Horse Show, Lexington KY Champion High Performance Hunter division with "Ante Up' Champion Performance 3'3" Hunter division with "Type Cast" Reserve Champion Green Conformation Hunter division with "Academy Award"
Reserve Champion at the Devon Horse Show, Amateur Owner 3'3" 35/over, Jane Fraze and "Academy Award". Champion Regular Conformation Hunter with "Academy Award" at the Upperville Horse and Colt Show, in Upperville, VA, the oldest Show in the country! Reserve Champion at the Pennsylvania National Horse Show in both the Regular Conformation Hunter and the Second-Year Green Hunter divisions with "Academy Award". USEF Horse of the Year Award, Regular Conformation Hunters, "Academy Award"
USEF Horse of the Year Award, Performance 3'3" Hunter, "Tache Rouge"